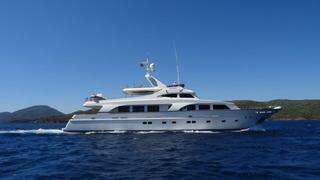 The 33.01 metre motor yacht Sunrise has been listed for sale by Eliad Hagiladi at Yacht Marine in Turkey. Launched in 2006 by Turkish yard Ses Yachts, she was built from an epoxy-laminated mahogany hull to RINA standards. Recently refitted, she can accommodate up to ten guests in five cabins, including a master suite, two VIPs and a pair of twin cabins. Meanwhile, the crew quarters of this yacht for sale allows for a staff of up to seven people. Her spacious aft deck includes built-in bench seating and an al fresco dining area with room for eight people to enjoy a cocktail or a light meal. Moving inside, her open-plan saloon features interior décor designed by Hasan Ulutas. The lounge area boasts two settees, while further forward the formal dining area provides seating for eight guests around a curved wooden table. Key features include her upper-deck bar area, with seating for nine, while the raised observation deck has enough room for three sunloungers just aft of the upper helm station. Highly specified, she features a Bose surround sound system, Condaria air conditioning and galley equipment by Gaggenau. Power comes from a pair of 1,055hp MTU diesel engines that allow for a top speed of 16 knots and a maximum range of 1,500 nautical miles at 11 knots drawing on a total fuel capacity of 16,500 litres. Moreover, Naiad stabilisers ensure a smooth cruising experience and she comes with a pair of Northstar tenders.